3 years ago we fitted shelves in our dining room and moved the fish tank in. We were left with a lovely big space on the wall above our fish tank that was perfect for a big statement picture. 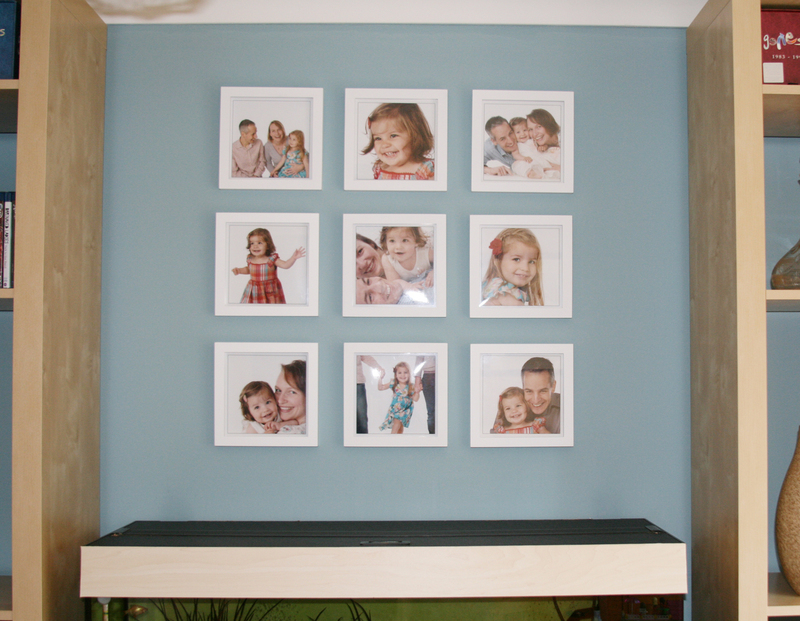 We'd had our photographs taken a couple of times at Center Parcs by Prêt-a-Portrait, that are based there, so we pondered on how we could display some of the images on the wall. 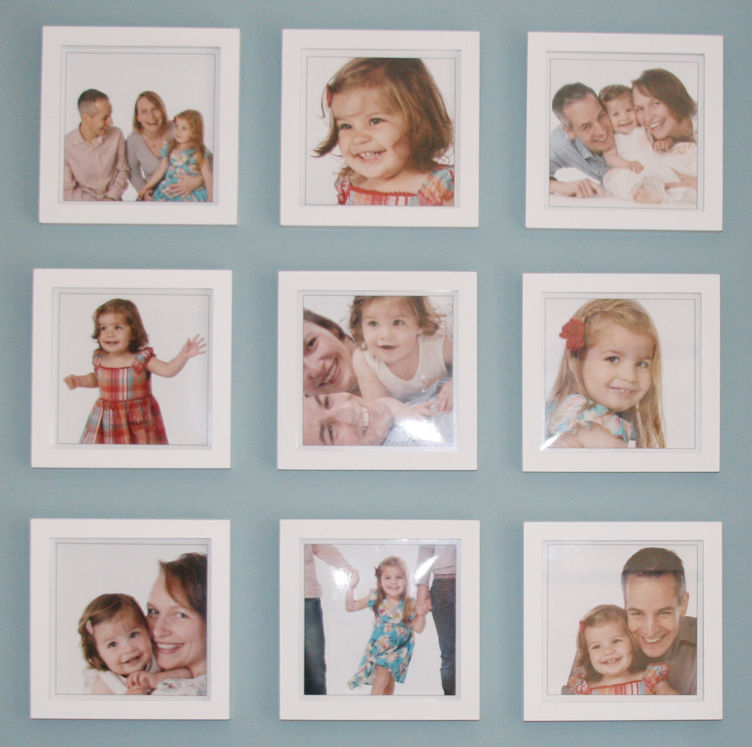 We considered buying one of their 9up photographs with 9 images on one, but this was going to cost well over £300. Also, it would only give us a single point in time and we didn't really want a photo of Maisie permanently as a baby - we wanted to see her growing up. The inspiration for this group of photos came from watching 'Modern Family' - of all things! I loved the grouping of 9 frames all the same, and we looked around for 9 simple square frames. 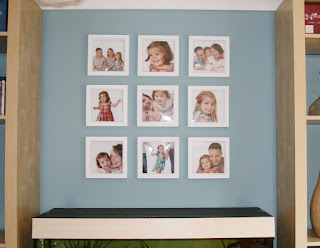 Finally we found some white box frames at John Lewis that complemented our room colour and fitted in with the simple effect we were aiming for. We opted for the 4" x 4" (10cm x 10cm) one as this could hold an unmounted photo of 18cm. Now it was simply a case of cropping all the images square, putting a grey border around the photos and then adding a white border to frame the images. 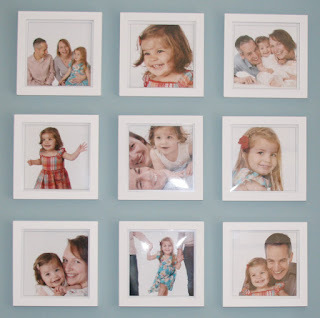 I really love our photo wall and the intention is to one day have 9 different complementary photos that will show us all growing older as a family.